I recently added an answer to a question that, unbeknownst to me, had been deleted while I was writing my answer. It seems to me that it shouldn't be allowed to add an answer to a question that has been deleted and, if it is allowed, then the answer should (by default) be deleted as well. It should work like when the question get closed, that you get a notification and you are not allowed to post. We should encourage this and create a whole site based on deleted questions and answers, just for 10ks and above. We need to talk about it like it's the most exciting thing in the world, and get everyone motivated to make it to Deleted Land (our version of Nirvana). Well, non-10k users aren't allowed to see or give answers to such deleted questions.. So I don't think that it's much of a problem. Not the answer you're looking for? Browse other questions tagged bug status-completed answers deleted-answers . Why should 10k rep users view self-deleted answers? 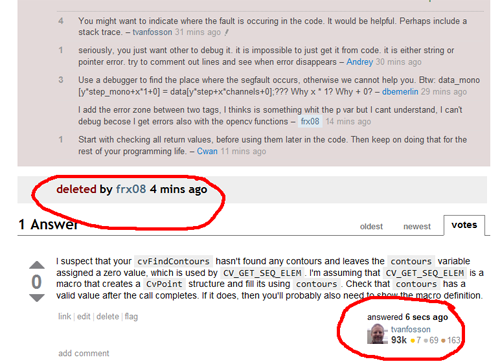 Undoing a question deletion that had a deleted answer brought the answer back?